280 pages/Seiten, 30.5x22.5 cm, Paperback: This is a collection of all the reviews of 45s that were published in `Billboard'in 1958. Included are cross-check listings by artists-name and song title. I am thrilled to introduce one of the most nostalgic and entertaining books we've ever published. 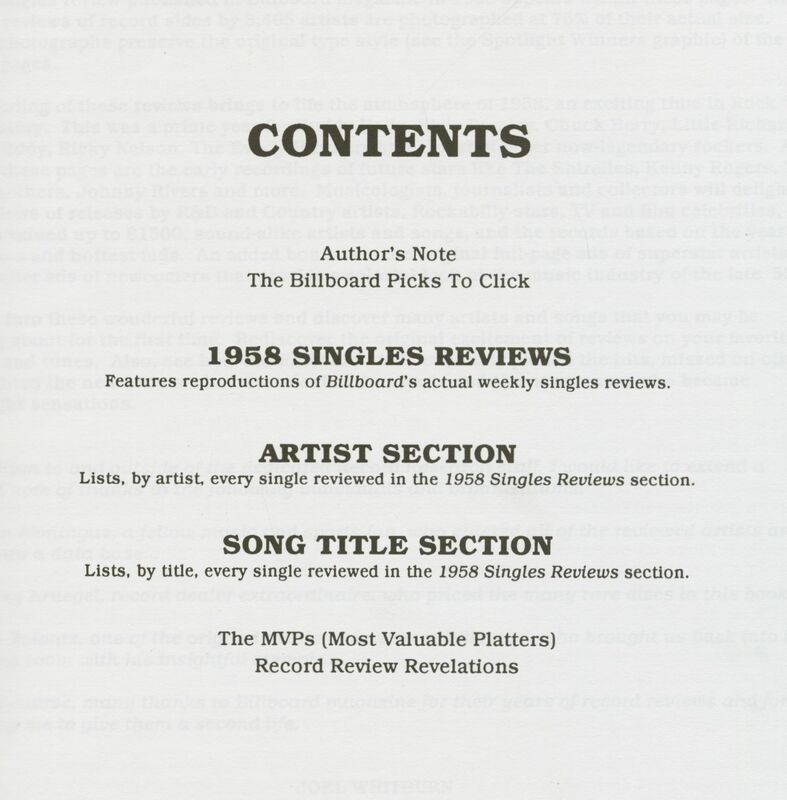 Every singles review published in Billboard magazine in 1958 appears within these pages. Nearly 10,000 reviews of record sides by 3,465 artists are photographed at 75% of their actual size. These photographs preserve the original type style (see the Spotlight Winners graphic) of the review pages. 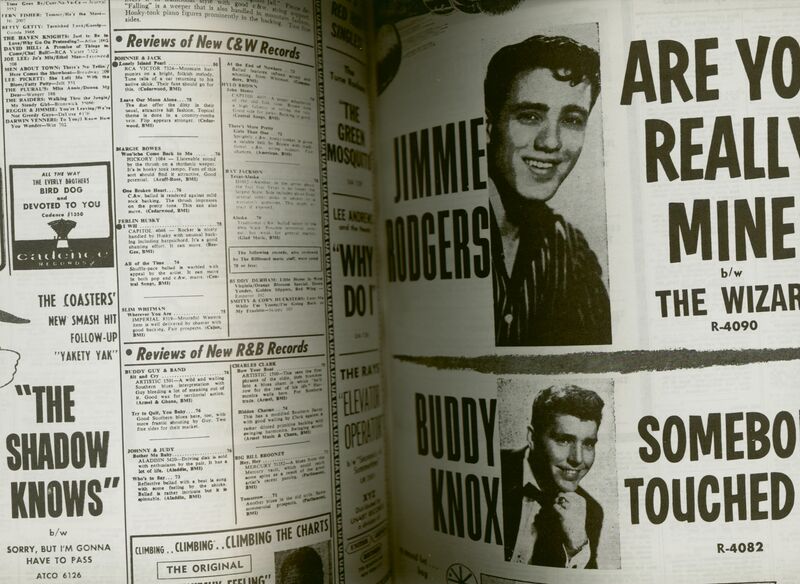 The wording of these reviews brings to life the atmosphere of 1958, an exciting time in Rock 'n Roll history. This was a prime year for Buddy Holly, Elvis Presley, Chuck Berry, Little Richard, Duane Eddy, Ricky Nelson, The Everly Brothers and a host of other now-legendary rockers. Also within these pages are the early recordings of future stars like The Shirelles, Kenny Rogers, The Isley Brothers, Johnny Rivers and more. 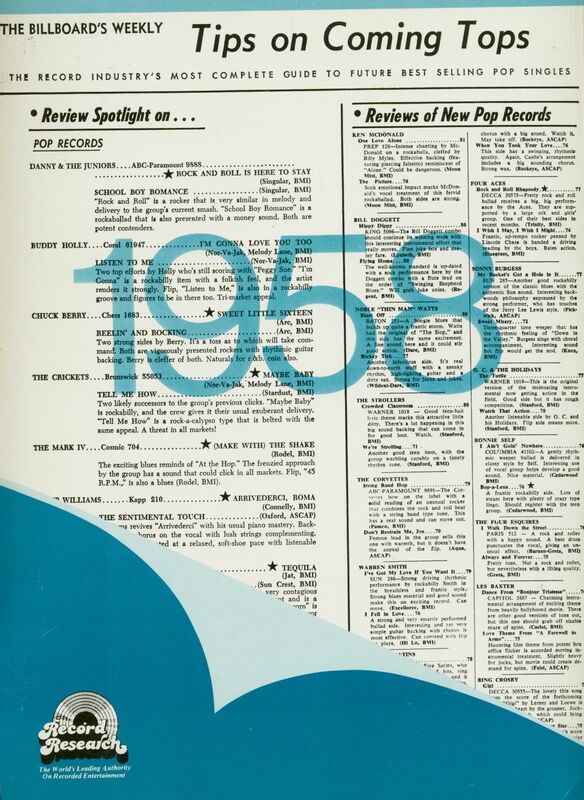 Musicologists, journalists and collectors will delight in the reviews of releases by R&B and Country artists, Rockabilly stars, TV and film celebrities, rarities valued up to $1500, sound-alike artists and songs, and the records based on the year's headlines and hottest fads. 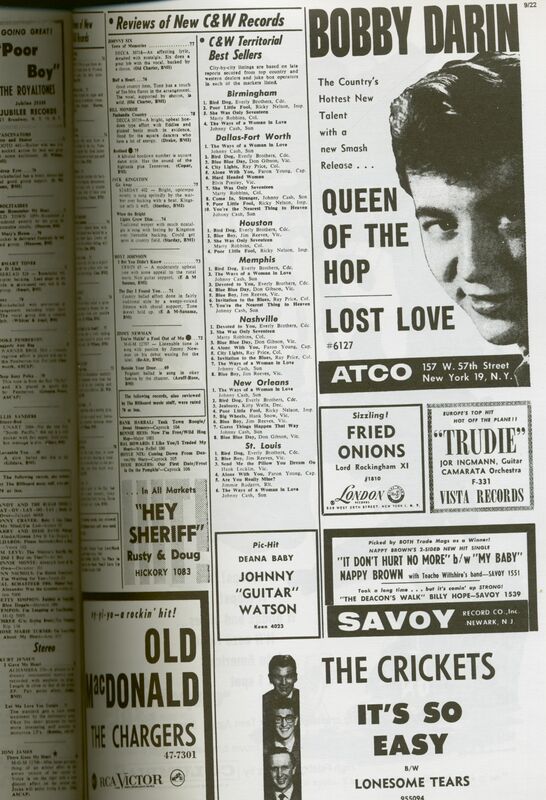 An added bonus are the original full-page ads of superstar artists and the smaller ads of newcomers that provide a colorful look at the music industry of the late '50s. So, dig into these wonderful reviews and discover many artists and songs that you may be reading about for the first time. Rediscover the original excitement of reviews on your favorite artists and tunes. Also, see how the Billboard staff accurately picked the hits, missed on others, spotlighted the new artists who never dented the charts and the newcomers who became overnight sensations. John Montague, afellow music and sports fan, who entered all of the reviewed artists and titles into a data base.Rocky Kruegel, record dealer extraordinaire, who priced the many rare discs in this book. 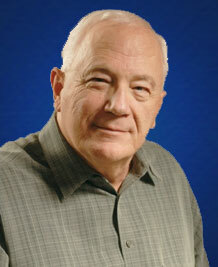 Bob Rolontz, one of the original music reviewers at Billboard, who brought us back into the listening room with his insightful memoir. And, of course, many thanks to Billboard magazine for their years of record reviews and for allowing me to give them a second life. 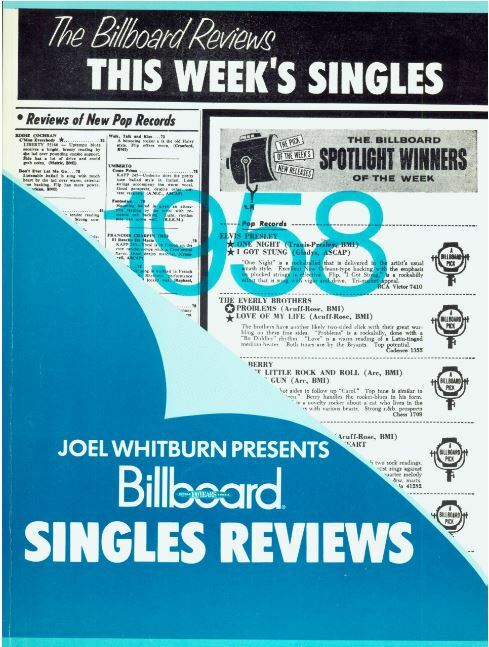 Évaluations de clients pour "Joel Whitburn Presents - Billboard Singles Reviews 1958"